Much of the work that I have done involves transferring technologies out of academia or federal laboratories. The framework for academic spinoffs is that typically there are technical co-founder(s) who are the subject matter experts in the technology. But investors have declared the days of “professors as CEOs” to be over. So often there is a business person who is also at the table at the founding of the company to handle the business matters and to provide a steady hand as the company takes off. I’ve been that business person at least six times. Through those experiences I’ve come to learn that the way career scientists think are very different from the way entrepreneurs think even when they share the objective of wanting their startup to succeed. Call these differences in perspective, or cultural issues, if you will, between the motivations of academics and entrepreneurs. Academics make their reputations based on what they know. They don’t “profit” from this knowledge until they publish it and can explain to others how to reproduce their work. Only then is their professional reputation enhanced and their research validated. Publication success is often a key factor in deciding whether an academic wins research grants or is offered tenure. For many academics, the recognition they gain by advancing knowledge in their field is sufficient motivation. But they will not see a meaningful financial reward for their work unless it is commercialized, usually by founding a successful business. 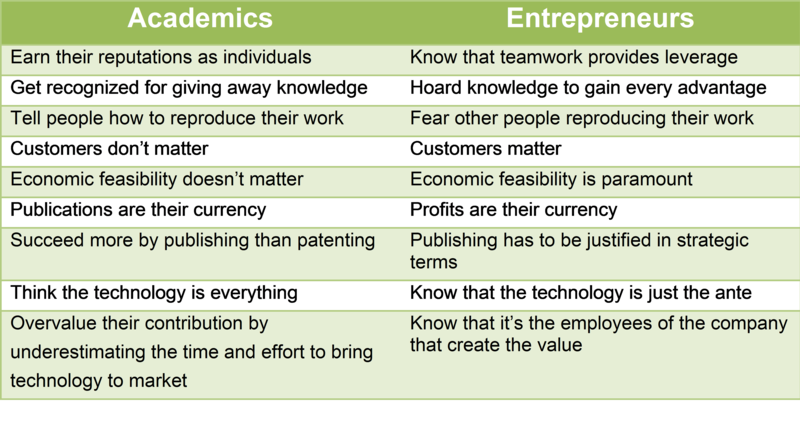 Business people and entrepreneurs have very different incentives and perspectives than academics (see Table 1). They don’t profit from their work until they create something that has commercial value, which often comes from exploiting privileged information. The best entrepreneurs I know are not concerned about getting credit for their ideas; the financial payoff is reward enough. The typical behavior of an academic — “Let’s publish!” — is the exact opposite of what one would want if the same technology were developed inside a company. The pursuit of money by business people if often repugnant to dyed-in-the-wool academics,especially if it requires protecting, and not revealing, information. Filing for patent protection is one way to bridge this gap. Information can then be disseminated and maintained for the exclusive use of the patent holder. In my experience, the process of starting a business usually throws academics far outside their comfort zone. It is a very unsettling feeling to have the fate of one’s technology put in the hands of someone else. Scientists tell me it is like putting your child up for adoption. This loss of control is a great obstacle to making progress because, to alleviate their anxiety, scientists often make decisions that are counter-productive. Scientists are habitually reluctant to give up a meaningful piece of their company to the management team or investors, although only by bringing in new resources and leveraging the talent of others can wealth be created. Instead, they often prefer to take the investment offer that dilutes their ownership the least, although frequently it may not be the offer that maximizes their wealth in the long run. Having seen this issue cause great harm on several occasions, my current template for forming businesses requires the scientist to find a trusted advisor who can help set their expectations appropriately and assure them that they are not being taken advantage of. Scientists habitually overvalue their technology because they don’t appreciate the time and money needed to turn it into something that can be profitably offered for sale. One of my projects involved a group of scientists who developed a hardness coating that could extend the life of rotating machinery. They had developed a prototype that they had tested in the laboratory, which performed wonderfully for three weeks. Sensing a purchase order was right around the corner, they planned to form a business to commercialize the technology. But we later discovered that — according to industry practice — such coatings have to be subjected to extended wear testing for at least 2.5 years before they are even allowed to be sold. 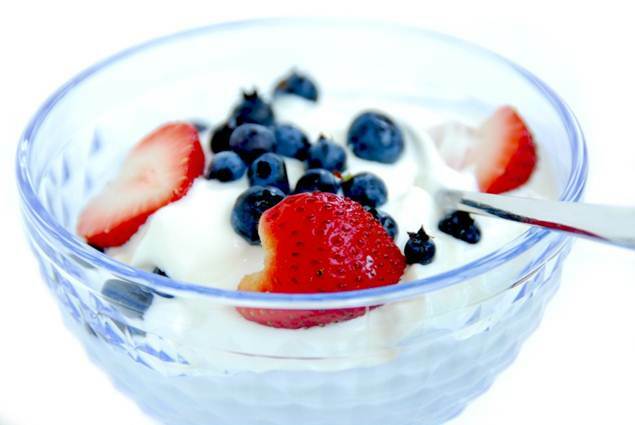 That’s over 160 times longer than their lab tests — and at the time they did not even have the foggiest notion of what it would cost to produce. I remember once talking to my high-school physics teacher, who had been one of the leading teachers in our district for decades. “Don’t you get tired teaching physics?” I asked him one day. The same wisdom applies to securing financing for startups: investors don’t fund technologies, they fund people. The corollary is that companies don’t bring technologies to market, they bring products to market. In all of the companies that I have seen become successful, the venture capital arrived with the management team, not the technology. But even outstanding management teams need a technology platform on which to build. The scientists need management, and vice-versa. So are scientists capable of abandoning their natural tendencies to publish? Can entrepreneurs build great businesses while being honorable stewards of the underlying technology? Yes, but both sides need to understand each other’s motives and recognize the contributions that each party brings to the table. Scientists who fancy themselves as business people often make elementary mistakes simply because, although being smart, they lack experience in such domains. Similarly, business people who alienate the technical team are also in for trouble because the early stages of a business are often dominated by technology development long before the company has any traction in the market. So the parties need one another. Indeed the model of tech transfer presumes both business and technical people are part of the founding team. Without a profit motive, nothing will get manufactured, and there is no wealth creation until something is sold. Portions of this post were published in an article in the March 2004 issue of Physics World titled “Rich or famous: you choose” by Neil Kane. Great post. Setting expectations for scientists is key. I struggled with this in my current start up. Any insights as to how to delicately have the conversation that “ideas are just ideas without the execution?” This conversation inevitably devalues the scientific idea initially, but is so necessary to have in order to build contingencies, and build support for talking to customers before the innovation is complete. I think the answer lies in having a short term operating plan that gets revised every month or two. Having clear, focused goals is the solution the problem. If you can’t get the scientists to agree to the goals, that’s another matter. But I learned the hard way of the necessity of having an operational dashboard that everyone is focused on. Even in the early going when it may not be clear what is predictable (like revenue) you can still have development goals.